I'm always on the lookout for good Final Fantasy art books. It's incredibly difficult — Japanese arts especially — to differentiate game guides, screenshots books and concept art books. The first Final Fantasy art book I had was Final Fantasy IX Visual Arts Collection, which was sold away because it's basically a screenshot book with a few sketches. Yoshitaka Amano did the character designs in there too, if I remember correctly. Dawn: The Worlds of Final Fantasy contains the development sketches of the first four Final Fantasy games, I to IV. All the characters in this book are foreign to me since my first acquaintance with the game was Final Fantasy VII. All with the exception of the monsters and summons which are also used in later series. An index of titles is provided to identify the characters. This is a character design book. Right at the start are a few foldout pages that unfold into larger illustrations. Most of the illustrations are done in pencil and watercolour. The designs are filled with detail although they are really sketches with furry pencil lines. A few black and white designs towards the end of the book. If you're played the games before, you'll see familiar characters like Cecil Harvey, Rosa Farrell and Cid, just to name a few. There are of course lots of creatures — high level ones — like dragons, Leviathan, Ifrit, Odin, Bahamut, Chocobo, etc. It's interesting to see how the designs of these traditional legendary creatures have evolved since the first game, which was released in dot matrix. I'm really glad to see that Chocobo is now cuter in the later versions (original Chocobo in the pictures below). There are no game screenshots or highly polished splash pages in this book. All are concept art by Yoshitaka Amano. This book is recommended to character designers and game artists with reservations. Whether you like the book will depend on how much you like the style of Yoshitaka Amano. Check out the Kusanagi art books if you're into Final Fantasy background art, those that are used in game anyway. With the FF-series, or rather the later titles in it, it's interesting how Amano's art style is never translated directly into the game. It's quite unfortunate really and begs the question why he's doing the concepts in the first place, when the characters eventually get "dumbed down" into more generic looking 3d versions. 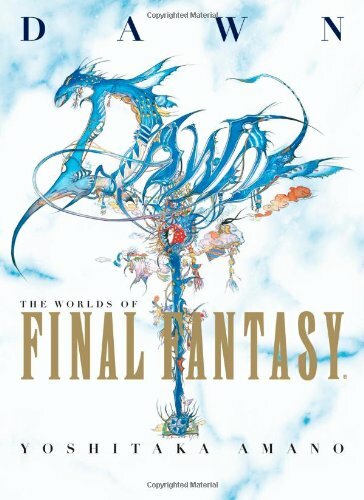 Usually the concepts and final 3d renditions are closer to each other in style than with the FF-series and I feel like they have Amano draw up the initial concepts just so they can say "Hey look, we have THE Yoshitaka Amano making art for our game(s)! ", even though the work is hardly seen *in* the game. I must say, a real Amano-style Final Fantasy could look very neat though. We need more artistic interpretations in games anyway. I can't agree more. The lack of resemblance to the actual game characters always make me wonder if it's really a Final Fantasy art book. But he wasn't really THE Yoshitaka Amano until after he did the work for the FF games - they're still what he's best known for in the states. Amano doesn't do much if any true concept art these days for the 3D games, but you could definitely tell where they tried to capture his style in the older 8- and 16-bit games. This looks like a beautiful book. Very simple, focused on the art. Do you mind if I use a few of your photos in a post on my blog? It's focused on old school D&D. I would of course give you credit and a link back. Sure. Just post a link back will do.